With five different leaders in the final round, it was a fast-and-furious finish to the 20th NTRA National Horseplayers Championship (NHC), presented by Racetrack Television Network, STATS Race Lens and Treasure Island Las Vegas. 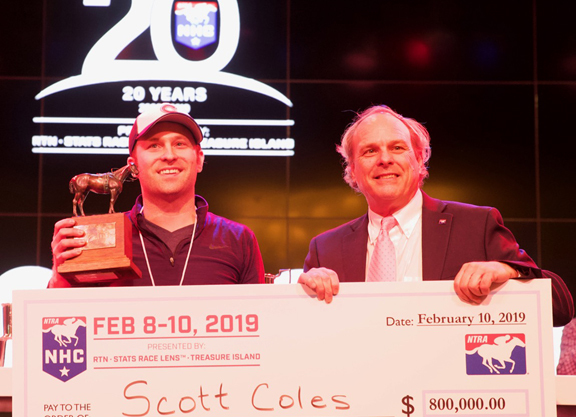 In the end, the 34-year-old, first-time qualifier Scott Coles picked an 11-1 winner in the penultimate race of the tournament that vaulted him to victory and an $800,000 first-prize award. The Chicago-based futures trader has been handicapping for less than a decade and playing tournaments only for the past 2 1/2 years. Coles amassed a bankroll of $367 over the three-day tournament, besting runner-up Jim Meeks at $356.60. Meeks, Joe Perry, Steven Simonovic and J. Randy Gallo all took turns leading in the final round, which was comprised of seven mandatory races, the last of which was the scratch-depleted finale at Santa Anita. That put added emphasis on the race prior, the eighth at Golden Gate, and Coles positioned himself for the win by selecting the 11-1 I Love Romance (Black Seventeen). He then sealed victory by picking the short-priced winner of the final race. Rounding out the tournament’s Top 10 was Jim Meeks, Mathew Vagvolgyi, J. Randy Gallo, Steven Simonovic, Joe Perry, last year’s champion Chris Littlemore, Robert Gilbert, Marshall Gramm, and Frank Drew. It’s been a big year in Thoroughbred racing for Marshall Gramm. The economics professor and co-founder of Ten Strike Racing was represented by the stable’s first Grade I winner last June when Long On Value (Value Plus) won the GI Highlander S. at Woodbine. His homebred Dot Matrix (Freud) became a stakes winner a month later. Then in November, Gramm and his Ten Strike partners sold Divine Elegance (Uncle Mo), a $50,000 claim, for $750,000 in foal to Tapit at Fasig-Tipton November. Gramm capped things off with a huge run at the NHC. As one of only four people to have both of their entries make the semi-final–or top 67 entries–Gramm came into Sunday’s action as a Top 10 performer and was in 7th as they moved on to the Final Table. He wasn’t able to make up any ground on the leaders in the final round, though, and checked in ninth. Gramm will hope to keep the momentum rolling on Saturday with recent stakes winner Harlan Punch (Harlan’s Holiday), who goes in the GIII Mineshaft S. at Fair Grounds. Connections have said that a good effort punches his ticket to the $1.5 million G2 Godolphin Mile in Dubai Mar. 30. Michael Levinson didn’t make much of an impact on the leaderboard during his NHC run, but the Tulsa, Oklahoma resident cashed a long series of side bets at the Treasure Island ballroom. More importantly, he had a weekend to remember alongside his father Lee, who accompanied him to the NHC. The Levinsons are more familiar to the racing world as the owners of Lookin At Lee (Lookin At Lucky), who ran second to Always Dreaming (Bodemeister) in the 2017 Kentucky Derby at odds of 33-1. Levinson narrowly missed the NHC cut by finishing 21st in the live-money Breeders’ Cup Betting Challenge at Churchill Downs, but a defection bumped them into the Top 20 and earned them a trip to Vegas. It was Levinson’s first NHC appearance. L & N’s racing manager. The Levinsons are primarily involved in the oil and gas industry. Lee, an attorney, also co-owns a cigarette-manufacturing company. Lee has owned horses for over three decades, but L & N was formed just four years ago. “Lookin At Lee was from our first crop of horses,” said Michael. The Levinsons do most of their own selection at auction, with Lookin At Lee’s trainer Steve Asmussen offering advice, as well. They found Lookin At Lee at the Penn Sales consignment and secured him for a modest $70,000. “That was the first time we’d been to a sale and we really didn’t know what we were doing, but we liked him when he came out and he was in our price range, so we took a shot on him,” said Michael. That shot paid off in spades. Lookin At Lee was a stakes winner at two, ran second in both the GIII Iroquois S. and GI Breeders’ Futurity, and then was fourth in the GI Breeders’ Cup Juvenile. At three, he was third in the GIII Southwest S. and GI Arkansas Derby before nearly overcoming the dreaded one hole in the Derby. He was beaten 2 3/4 lengths by Always Dreaming, with a five-length gap back to Battle of Midway (Smart Strike). Lookin At Lee raced five times in 2018, winning a Churchill allowance on the Derby undercard, but was given some time off to address a breathing problem following a fourth in the Michael G. Schaefer Memorial S. at Indiana Downs in July. Asmussen’s father Keith handled the lay-up duties. Lookin At Lee now has a series of four- and five-furlong drills at Sam Houston. Lookin At Lee has earned in excess of $1.1 million. The Levinsons hope to make a more international splash this spring with the 3-year-old colt Tone Broke (Broken Vow), who after starting his career in the States, shipped over for the Dubai World Cup Carnival. Tone Broke, who is trained by Asmussen, won a maiden special and allowance race at Remington Park last fall. 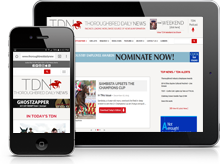 Fourth in the Springboard Mile, he reemerged in the deserts of Dubai and came home sixth in his initial go in a Meydan conditions event Jan. 24. Tone Broke was a $40,000 Keeneland September grad. L & N ramped up its buying at the sales last year, landing eight yearlings in total. At September, they purchased a Speightstown half-brother to the GSW J Boys Echo (Mineshaft) for $100,000 and a Ghostzapper colt from a half to GISW Shaman Ghost (Ghostzapper) for $130,000. For Lee, the allure of racing is simple. “We just like the thrill of it all,” he said.